Touted as the world's first electric vehicle featuring both fuel cell and plug-in hybrid technology, the Mercedes-Benz GLC F-CELL ushers in a new era of zero-emission mobility. Mercedes-Benz has started handing over the first few pieces of the GLC F-CELL to select customers in Germany. 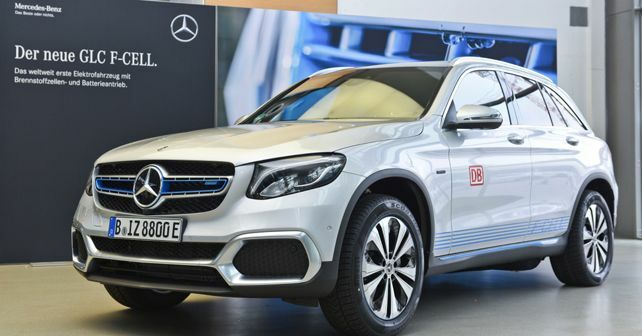 As the name suggests, the GLC F-CELL is a hydrogen fuel cell-powered car but it is one-of-a-kind since it also houses an electric power source. Therefore, the car can be used in three operating modes: On pure Hydrogen, on pure electric power drawn from a high-voltage battery or in the hybrid mode where the car draws power from both its sources in which the battery manages the power peaks and the fuel cell runs in the optimum efficiency range. The battery can be charged externally using plug-in technology and in all operating modes, the drivetrain system also makes use of an F1-style energy recovery function which allows the battery to be charged using the recovered energy from braking. The Hydrogen setup of the GLC F-CELL comprises two carbon-fibre-encased tanks located on the vehicle floor which can hold about 4.4kg of liquid Hydrogen. Just like refuelling a combustion-engine car, the Hydrogen too can be replenished in the same manner and time. With Hydrogen consumption of around 1kg/100km, the GLC F-CELL can do around 430 kilometres on hydrogen power alone. When used in hybrid mode, the range can extend by an additional 51km on a fully-charged battery. Details about the car's range in pure electric mode have not been revealed yet. However, despite all the green tech, the car isn't a slouch as the combined power figure of the GLC F-CELL sits at 208bhp. Like its combustion-powered siblings, the GLC F-CELL also features selectable Eco, Comfort and Sport drive programs.